This is a story of a girl who tried barefoot running. She researched a bit first and then took the plunge. She started her blog and gave herself the name "Barefoot" even before she knew whether she was actually going to be a barefoot runner or not. It's a good story to read if you want to know what to expect. And it's a good story to read if you've forgotten what it's like to be a beginner. It happened overnight. We had our first light dusting of snow for the season. This happy barefoot runner did not feel as happy about the first snow as she usually does. In fact, she looked out the window with a bit of dismay. Maybe it will be gone by tomorrow, when my next run is scheduled. I kept staring at the snow, and as I came back in the house, dragging the garbage cans in behind me from the curb, I still kept staring at it. I wonder what it would feel like to just step out there and see what it feels like? I mean, it won't hurt me to go outside, take a picture of my feet on the snow, will it now? A minute or two wouldn't hurt, would it? I definitely am not going go barefoot running in the snow this year, but, well .... it's only a light dusting of snow and it looks like very dry snow. Yeah, but as soon as my feet touch the snow it won't be dry. It will melt and it will be wet and freezing. But what would it cost me, really, to just go out and take just one eeny little picture for my blog? I mean, it would be fun. I have a Summer picture of my feet outside, a Fall picture of my feet outside. This could be the Winter version. Oh, I simply must have the Winter version! I admit it was hard to take of my socks and Terra Plana Vivo Barefoot Kali shoes that were keeping my feet relatively warm. But once the decision had been made, then I just saw it through. Amazing! It was not miserable. It actually felt pretty good! I could definitely feel that the cold-weather conditioning I've been doing over the past couple of weeks had produced an insulating kind of effect. 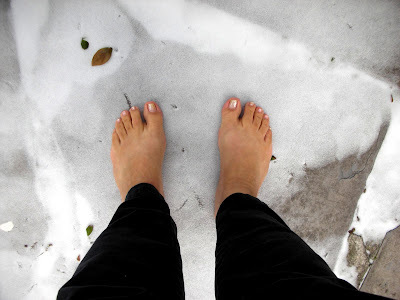 I felt definitely like my feet were prepped or ready for this and that it did not feel as cold and freezing as it might have had I not accustomed my feet to the cold. The strong, tough skin on the soles of my feet which had developed over the past 145 miles of barefoot running almost felt like a layer of protection, almost like a kind of "shoe" on my foot. I'm not saying it wasn't cold, but it was surprisingly more comfortable than I thought it would be. But I have no idea what it would be like to remain out there. I was only out there for about 3 or 4 minutes. I wonder how long I would be out there before my feet started to freeze. But then I thought that maybe they wouldn't freeze because I'd be running and the activity would keep the feet warm. There really would be no way of knowing for sure until one gave it a try, would there now? 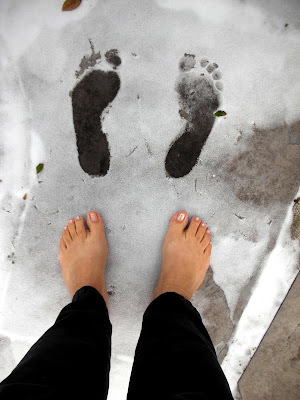 Maybe running barefoot in the snow would also work like learning to run barefoot at all, or learning to run barefoot in the cold, and have to be done incrementally -- bit by bit, increasing very gradually? Maybe by taking these little steps out I've already begun? No, no no! It's not the right time. I will not, shall not, run barefoot in the snow. I will not do it in a house. I will not do it with a mouse. I will not do it here or there. I will not do it anywhere. Mark my words, I will not run barefoot in the snow! Do you hear me?! I would think the snow would feel different than the road. I seem to have not acclimated to cold ground as my feet get numb. Mama, I wouldn't be surprise if there are individual physiological differences between people that make it more or less possible for some or others. Just like some people can eat certain foods that others can't, and some people need 7 hours sleep and some 9. There's probably a factor of taking heat and cold tolerance that varies from individual to individual. Sometimes that's what I think barefoot running is really all about -- finding out about what your personal running machine is all about. There is no one-size-fits-all mode. I'm delighted to find out what's possible for me as I experiment. Maybe it's because I'm part Lithuanian and it gets cold up there in the north. Maybe I have a gene that can take the cold or something. Its funny. I've been going through much the same thoughts and reactions as you. Last winter I didn't really try to run barefoot even though I had started during the previous summer. But this year I'm almost daring myself to keep going as long as possible. So far so good. Keep up the running and writing!! Well, Bob, we're probably having a similar experience because of the amazing weather we've been having. I think that our beautiful warm November tricked us into thinking that the barefoot running season lasts much longer than it really does and we're having problems with denial that the cold is finally coming. Ha-ha, Ewa! I'm as close as I'll get this year, I think ... or am I? I'm a little envious. You're doing great! Your caution and patience are what will make you continue to learn at a rapid pace. Great post! I started reading it, and got about half-way through it when I couldn't read any more--I HAD to get out and run. So I ran a kilometer on the cold, but snow-free streets in my neighborhood. No, I wasn't barefoot. I ran in a pair of moccasins, to see if they'd be practical for "barefoot-style" running during the cold months that coming up. And it worked great! We haven't had any snow yet, here where I am (just northwest of Boston.) But when we get our first snowfall, I will do my best to follow your example. Thanks for getting me out of my chair and out onto the road! P.S. When I got back from my run, I read the rest of your post. Loved it! Six Month Anniversary -- 150 Barefoot Miles! Barefoot Mile #148 -- Sunrise!! Hello world! - WordPress へようこそ。これは最初の投稿です。編集もしくは削除してブログを始めてください ! So Long, and Thanks For All the Shoes - There once was a pun-loving runner Who thought there’d be nothing funner Than to blog about feet And how they’re so neat But now, he is all done-r.
Out of Commission -- What a Pain in the Fibula! Peroneal tendonitis or Jones fracture? Kung Fu -- Barefoot or Minimalist Shoe? 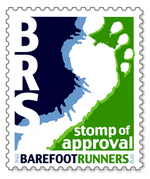 Barefoot Running Better for Overweight Runners? "Singing With An Orchestra Running Barefoot"
"New-to-Me Information on Breathing -- Active and Passive Inhalers and Exhalers"
"Building From the Ground Up"
"First Element of Barefoot Singing -- Back to Nature"
Simple theme. Theme images by mammuth. Powered by Blogger.